Red, White, Blue, and Craft Glue! Celebrate the quintessential holiday of summer with some red, white, blue, and craft glue! These adorable patriotic crafts are perfect for the Fourth of July, as well as Labor Day, Memorial Day, Veteran's Day, and any other time of year. Your kids will love these ideas, so get crafting! This craft is just beyond simple, and so creative, you'll wish you thought of it yourself. Make a giant balloon flag to celebrate the best holiday of the summer! Try this super easy craft made with themed cupcake liners you can find in any grocery store! Get creative with your designs or go beyond basic red, white, and blue. Nothing says summer like mason jars! This craft is as functional as it is fun. Make these with your kids and use them as decoration, utensil organizers, or votive holders! Here's both a fun craft to make and a fun hat to wear! This is perfect for a backyard barbecue activity with the kids. Firework rings: a very cool accessory that's super easy to make! Just grab some sparkly pipe cleaners in patriotic colors. This is a great craft to do with kids at a backyard party or a couple days before the Fourth! There's always extra paper plates floating around after an outdoor bash. So get the kids involved in a little upcycling and make some fun decorative flag plates! Have the best decorated door in the whole neighborhood with this cute patriotic star wreath. Paper, ribbon, and anything else you want to get creative with goes a long way! Marble painting is the perfect compromise between finger painting and keeping (mostly) clean! The kids will love this fun sensory activity and make some adorable art while they're at it! If you haven't heard, slime is the latest big thing! A throwback to silly putty and elementary school science experiments, even adults love making slime. This is a fantastic red, white, and blue slime recipe to make this Independence Day! An easy and decorative ribbon windsock is the perfect porch-front Fourth of July decor! This project is so easy, you just need an embroidery hoop and some festive ribbons! This cute craft makes for a perfect party game! Get the neighborhood kids together for some backyard fun to make and play this easy bingo board. This adorable craft is on a whole new level in the classic handprint craft repertoire. Make a cute popsicle stick face and then add Uncle Sam's characteristic white beard with some little hand cutouts! With the daylight at it's peak in midsummer, you've got to start making good use of all those rays. This easy suncatcher craft is patrotic, festive, and perfect for early July! Besides barbecues and fireworks, hometown Fourth of July parades are easily one of the best parts of the holiday. Make this fun parade wand with your kids to wave at the passing floats! 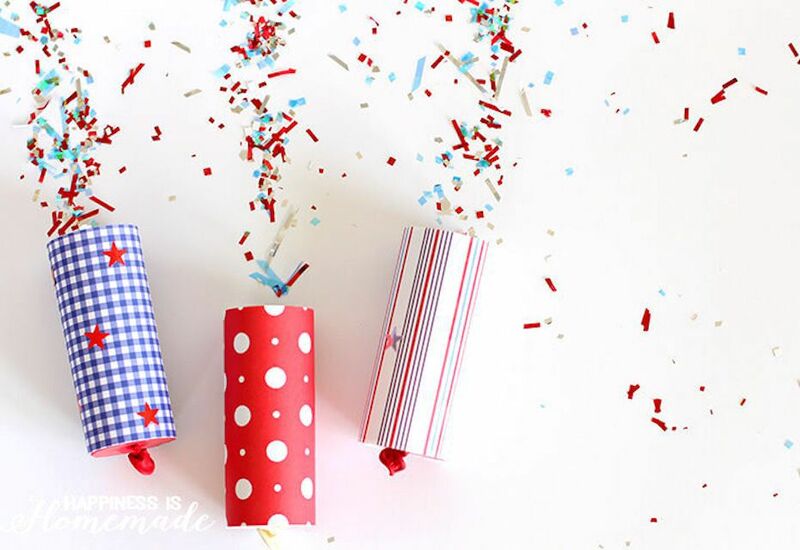 How much fun are these DIY confetti poppers? These are the perfect thing to pass out at a party during the fireworks. Fun for kids and adults alike! Put all the leftover popsicle sticks from all those ice cream truck purchases to good use with this cute button flag craft! A craft so easy, you'll be mad you didn't think of it yourself! A chic stars and stripes flower pot is just the thing to get your yard ready for a barbecue. Washi tape can take any household item from ordinary to extraordinary! Cute America-themed washi tape makes regular white plastic cutlery part of a full Fourth of July dining experience. These oh-so-sweet red, white, and blue paper flowers are the perfect centerpiece or porch decoration for this summer. Totally chic and totally homemade! This is such a cute activity for the youngest of your partygoers. This sensory party bin is super easy and makes for hours of entertainment for little hands!